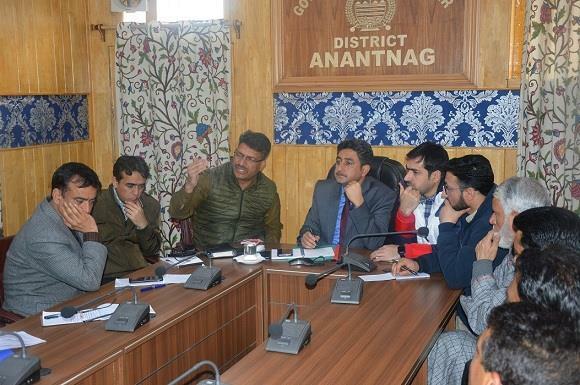 ANANTNAG, MARCH 23: The Deputy Commissioner Anantnag, Khalid Jahangir today convened a meeting of officers of Police, Transport, Traffic and Civil Departments at DC office, Anantnag for proper traffic regulation in Anantnag town. The vital routes leading to Child and Maternity Hospital and the District Hospital, Anantnag often remain clogged with traffic and create lot of hardships for the patients and other commuters. To overcome the traffic jams, the DC called upon the President Traders Federation Anantnag, Representatives of Transporters and Shopkeepers to discuss the traffic situation in Anantnag town and help in its smooth movement. The DC heard the suggestions and demands put forth by the representatives of the above associations and assured them that with the collective approach of people and district administration, traffic regulation will be made smoothly in the town. The President Traders Association, Anantnag suggested for construction of divider from KMD Masjid to Police post General Bus Stand, Anantnag for proper traffic regulation. He also suggested earmarking land for vendors near foot bridge Bangidar to avoid traffic jams. On the demands and suggestions of the Traders Federation and other unions, the DC directed EO, MC, ARTO, Tehsildar, Dy. SP and Xen R&B to identify the site for Auto load carriers and other transporters within a weeks’ time to get rid of the traffic jams in the town. He also directed EO, MC Anantnag to ensure the clearance of footpaths which have been illegally occupied by shopkeepers and vendors by keeping their goods on the footpaths. The meeting was attended by SSP Anantnag, ADC, ACR, ARTO, Tehsildar EO MC, Xen R&B & other officers of the district administration.